Before starting stage 2 of the Tour de France on Sunday, Peter Sagan in theory could have pulled on any of four racing jerseys. Strictly speaking, his black-and-green Bora-Hansgrohe team kit and his white-blue-and-red jersey as national champion of Slovakia were off limits, because they are always superceded by his rainbow jersey as world champion. 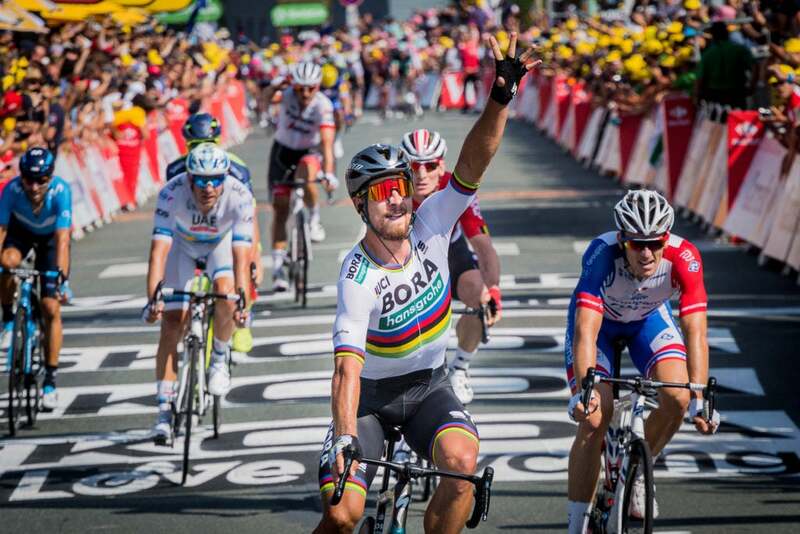 But, he did have a choice between those rainbow stripes and the Tour’s green jersey. 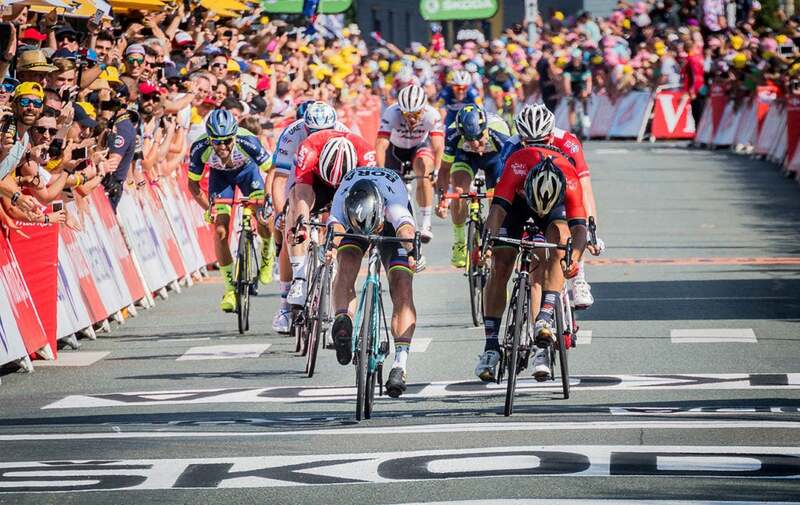 No, Sagan didn’t earn the sprinters’ green jersey on Saturday’s opening stage. That was taken by the stage 1 winner, and the Tour’s first yellow jersey, Fernando Gaviria. 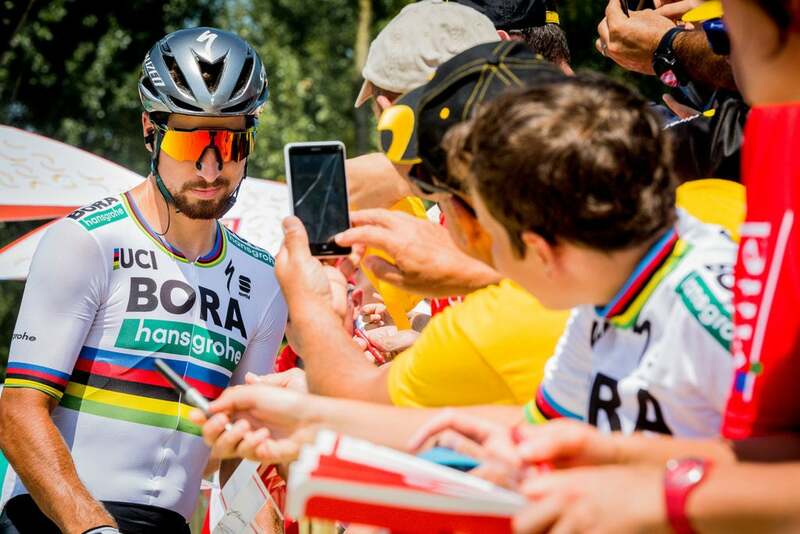 So, as runner-up, Sagan would normally have been told by the Tour organizers to wear green; but the Slovak decided he preferred rainbow, clearly conscious that he didn’t really want to wear a green jersey that wasn’t truly his. Instead, third-placed Marcel Kittel decked himself in a green skinsuit at the start of the day. But their wardrobe choices gained clarity by day’s end in La Roche-sur-Yon. 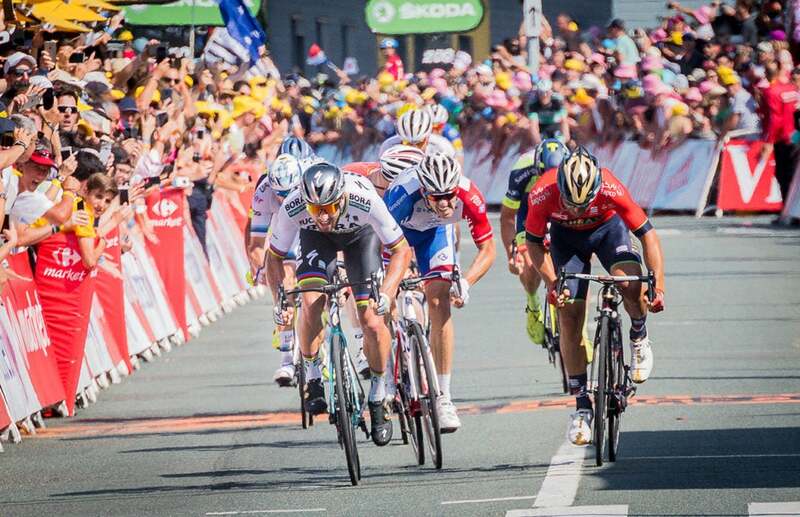 After Kittel had a rear flat in the final kilometers and then Gaviria got caught up in a pileup on the tight final turn, the advantage turned to Sagan. He still had two teammates, Daniel Oss and Marcus Burghardt, with him in the dozen-strong group that was left to sprint for the stage win. In the slightly uphill straightaway, he first countered a long-range effort by Frenchman Arnaud Démare of Groupama-FDJ and then just held off an ambitious Sonny Colbrelli of Bahrain-Merida to take the honors, his ninth Tour stage victory in six appearances. 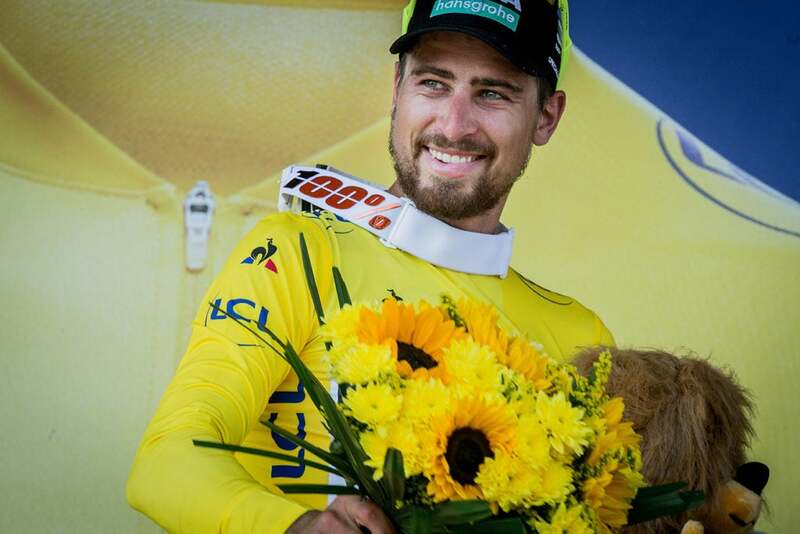 As a result of the time bonuses he earned from the first two stages, Sagan was awarded the yellow jersey—and also took the green. 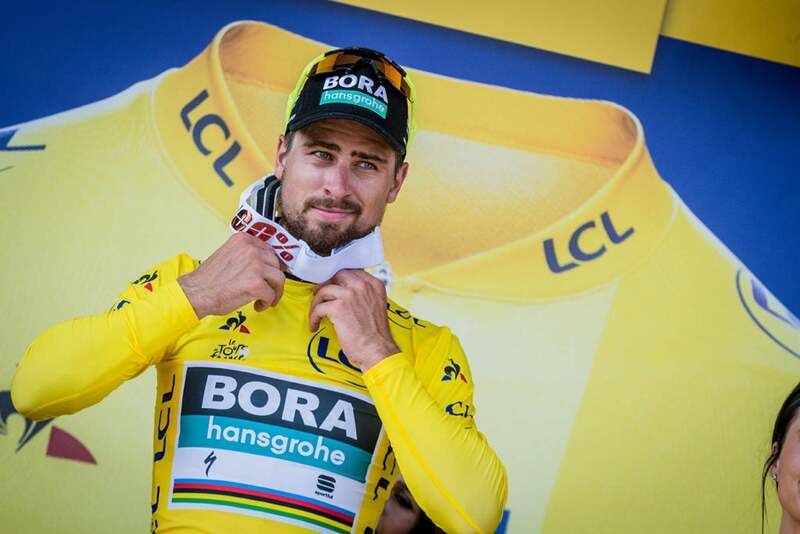 As for the yellow jersey, Sagan indicated it would be for only one day, because his Bora-Hansgrohe team is not expected to get close to the fastest teams in Monday’s team time trial. On his way to the podium to collect his new colors, he got a hug from his father, Lubomír Sagan, who is in France with friends from their hometown of Zilina in northwestern Slovakia.